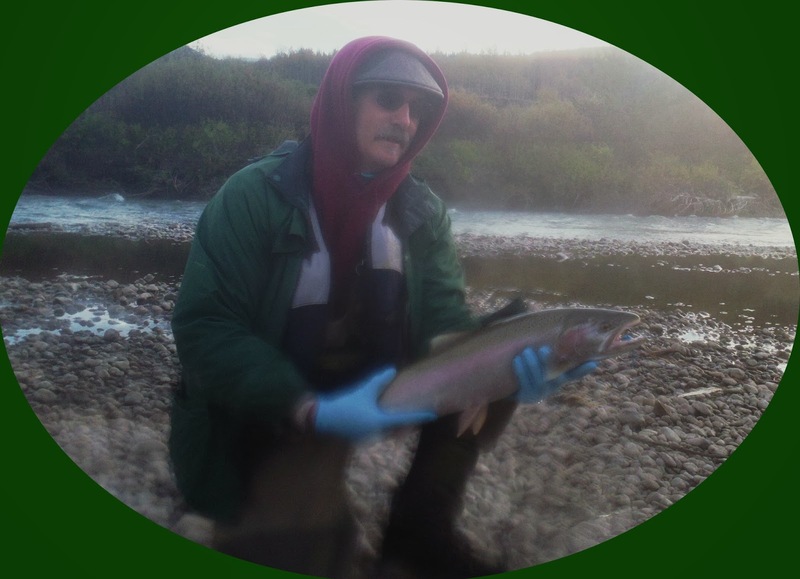 Just spent two weeks fishing a tributary of the Skeena River in British Columbia, Canada with old friend and horselogger Rod Gould from Greenwood B.C. We figure we floated more than 100 miles over 10 days of fishing for a fish a day. They say "steelhead are the fish of a thousand casts" but I know I had a few fish that took 3000 casts. We used our old beefed up 9' single hand rods. I'm going to be looking seriouisly at some of thjose fancy 13' poles to cover more water. 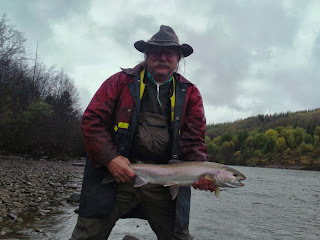 Most steelheaders use a 'spey' rod or "switch" rod that not only can shoot 100+ feet and cover more water but doesn't have a back cast and you can stand with your back against a wall and still make a fabulous cast. There will be a learning curve for both technique and equipment but it seems very appealing. Glad I got to see the north country before it's all used up. It was the finest fishing adventure I've ever had. 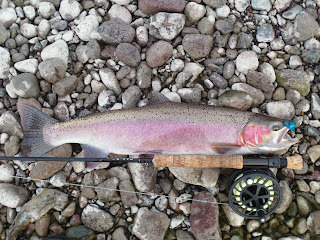 Caught my first steelhead on a wet fly and graduated to getting one to take a dry fly. Skating dry flies to steelhead is AMAZING! Both Rod and I landed 8 steelhead and lost as many in the 8 days of fishing. These were aggressive wild steelhead. Not one hatchery fish in the system. 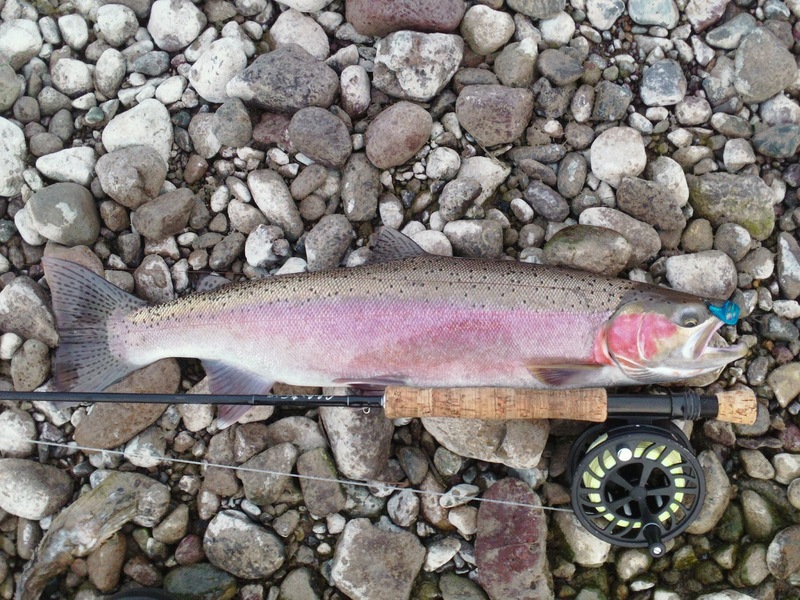 We did pretty good for what the authorities say was a skinny year for steelhead. There is great concern that this fishery is in jeopardy of dying from over fishing in the ocean and the river itself. B.C Fisheries have elevated the classification of many of the tributaries of the Skeena as Class I and II which require non-residents to obtain a $40 a day permit above the annual license and steelhead tag. Currently only locals can fish on the weekends in most of the system. We did meet fishermen from all over the world as this is regarded as a world class steelhead fisheries that the steelies will rise to the dry fly. The place attracts the most serious and arcane fishermen and women in the world. The world record steelhead caught on a fly was taken on the Kispiox, something around 37#'s although that may have broke by now. Each tributary seems to have it's own re-known strain of traits i.e. aggressive, large, summer, winter. Our stream averaged 6# to 15# fish with an occasional 20#er stuck to the bottom of the river. The hens are dime bright and wonderful fighters. I was blessed with a fine hen on my last cast of the last day. Her cheeks were as rosy as the sunset that fell over the river as a shouted "Halleluyah!" to the fishing Gods that I could hear chuckling to each other in the clouds. Yeah, Baby!!! Oh and by the way don't forget the Blue Horselogger Spercial that I made that caught all the fishies.